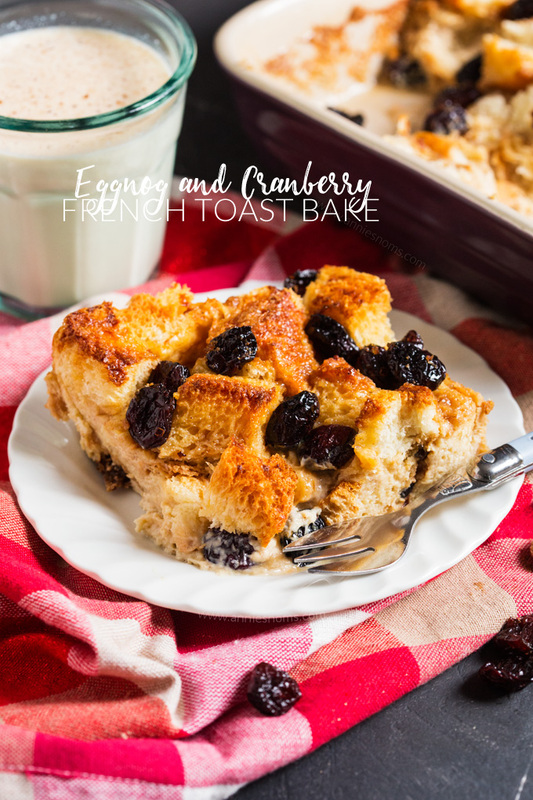 This Eggnog and Cranberry French Toast Bake is the perfect festive brunch recipe; easy to prepare and utterly divine, you are bound to fall in love with the sweet, spicy and cranberry filled recipe! Oh boy, do I have a recipe for you today! 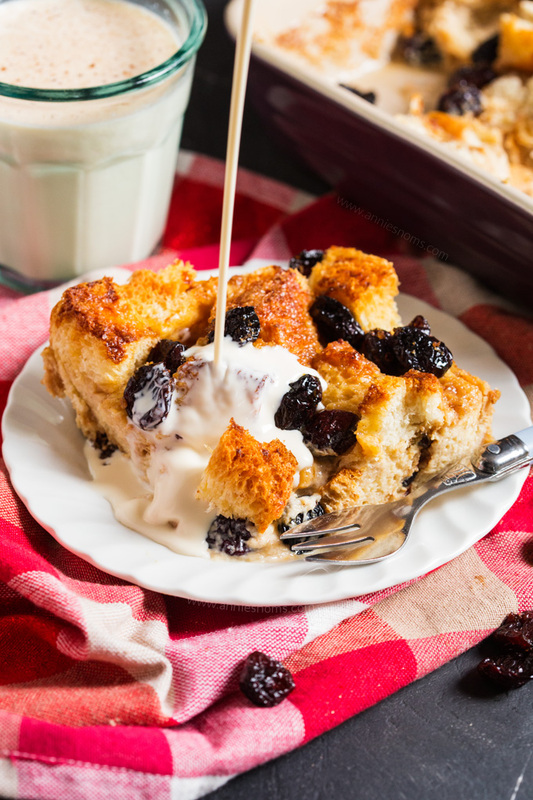 The most amazing Eggnog and Cranberry French Toast Bake. 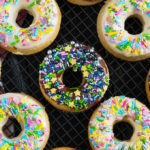 You can prepare it the night before, so that means come morning time, you can just bung it in the oven and wait for it to become golden, crispy, yet sweet and soft in the middle. 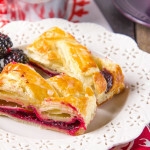 You can use fresh or dried cranberries (I used dried as I prefer them) and either way you make this, when you bite into a cranberry they explode in your mouth and offer the most amazing contrast to the sweet eggnog. Pure bliss. I am a French Toast addict, I just love the crisp on the outside, soft in the middle slices of eggy bread. I mean, fry anything and I’m game, but French Toast especially. It’s just wonderful. However, it can be a little more time consuming than a French Toast Bake as you’re dipping and frying slices. Whereas with this, you slice the bread into cubes, place it into a sprayed pan, add in the cranberries and then pour the eggnog and egg mixture all over the top. Leave it to one side overnight for the bread to absorb the sweet mixture and then in the morning, you just need to sprinkle it with brown sugar and nutmeg, pop it in the oven and forget about it for 30 minutes! 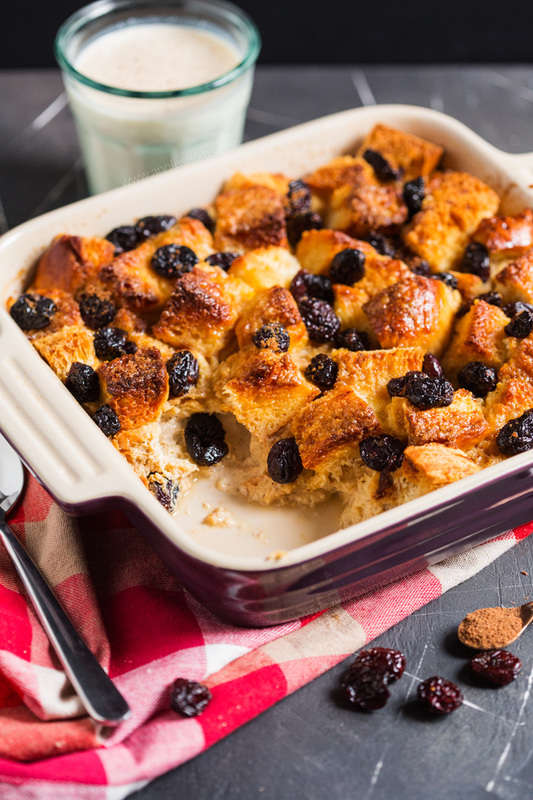 I know that Christmas morning can be hectic, so this is the kind of recipe where the bread and the oven do all the hard work, yet you end up with an amazing, flavour filled breakfast! The combination of eggnog and cranberry is such a winner in my eyes. Eggnog with its sweet vanilla and nutmeg flavour (and alcohol in most; I used my homemade non alcoholic eggnog for this recipe) and then the tart cranberries = the perfect balance of tart and sweet. Where are you on traditions? Do you have a set breakfast that you and your family have every year? I find myself following the traditions of my family and having ham on toast for Christmas morning breakfast, but I am not against change. I do find myself in routines and I like that, but I’m not obsessive about food traditions, if I fancy something different I will have it. My parents however, would never not have a ham. Apart from Christmas lunch of course, we don’t really follow many other traditions. We don’t have a roast on Christmas Eve, Boxing Day we have leftovers and mashed potatoes at my parents house which is the same ever year, but after that we just eat whatever. I’d love to know about your Christmas food traditions! Spray an 8x8 inch square pan with cooking spray. Sprinkle just under half of the cranberries into the bottom of the pan and then tip the cubes of bread into the pan. Spread out into an even layer, leave to one side. Place eggs, vanilla and nutmeg into a large jug and beat lightly with a fork. Add in the eggnog and beat with a fork until well combined. Sprinkle remaining cranberries all over the top of the bread. Tent a piece of cling film over the top and place in the fridge for at least 6 hours, or just leave it overnight. In the morning, preheat the oven to 180C/350F. Sprinkle the light brown sugar over the top of the bread and then sprinkle with a little nutmeg. Place in the oven for 25-30 minutes, until golden on top and when you shake the pan gently, the centre is set, but still wobbles a little bit. Leave to cool for around 30 minutes and then serve. 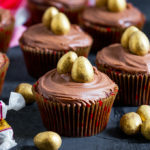 You can serve with extra eggnog poured on the top, or with a glass of eggnog! 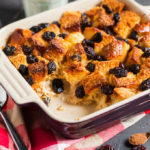 You can also leave the Eggnog and Cranberry French Toast Bake to cool completely and then when you come to serve, place portions on a plate and reheat in the microwave for 1 minute. Eggnog and Cranberry French Toast Bake will keep covered with cling film, in the fridge for 3 days. Follow above instructions for reheating. *Find my recipe for homemade, non alcoholic Eggnog here. This has got to be the prettiest, least messy french toast bake I’ve ever seen! Yumm! What a great breakfast option! Great for when the family is in town for the Holidays! This would be perfect to wake up to on Christmas morning! Love that you can just pop it in the oven that morning! What a great idea! I like the idea of using the rum eggnog version for mine, lol! OMG This is prefect for Christmas morning! I’d totally prep this for breakfast. 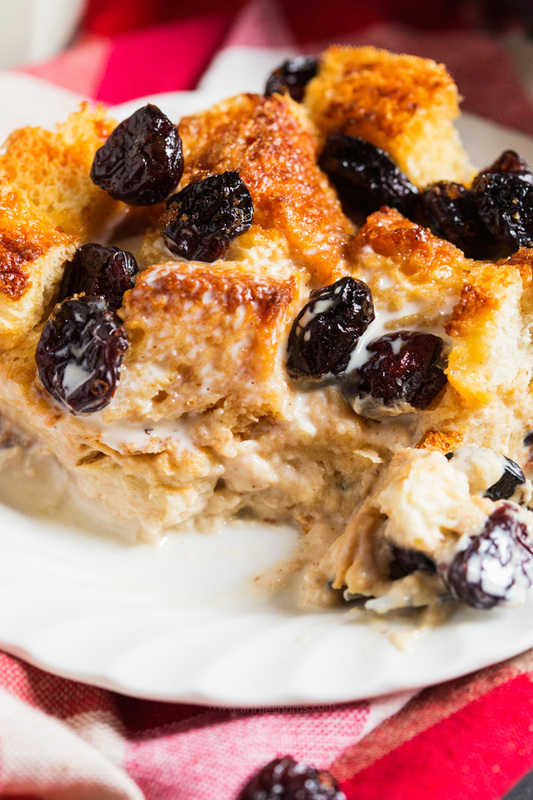 Love all the winning flavors in this French toast bake! 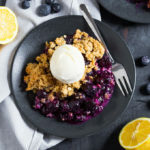 What a delicious brunch recipe! This just SCREAMS Christmas morning to me- so fun and festive and obviously so delicious too! Gotta try! My mouth is seriously watering! 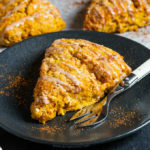 This looks so super delicious! I want to make this on Christmas morning! Omg that looks absolutely amazing. We don’t have eggnog where we live (but I grew up drinking it) so occasionally I’ll make some homemade eggnog and next time I do, this is giong to be made as well!! What a great breakfast option for a really busy morning. Love french toast! Wow what a cool twist on french toast. I love eggnog and I love cranberries! I am going to show this to the hubby. My whole family loves French toast. 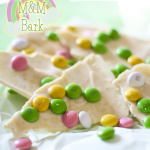 This is a great festive twist we will have to try! 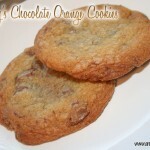 You seriously had me drooling looking at all of these pictures and the recipe looks really great. This would be perfect for the day after Christmas.